Creators of BAFTA award-winning Prison Architect have shown off some of the new features coming in the game’s sixth update, as well as two new prototypes they are working on. Looking for a place to tool around and build of your own? Try our best sandbox games on PC list for starting ideas. The update will bring several quality of life changes for job micromanagement including allowing you to see which worker will be taking care of a task and how far away they are from it, as well as the ability to batch-set high priority orders. On top of these, Chris Delay and Mark Morris have implemented a seasonal weather system to take advantage of the new temperature management layer, and can result in some big changes to your prison. For example, if there are lakes on your site torrential downpours can cause flooding, which can enter cells and destroy power generators if they aren’t walled off. Seasons last for seven days each, and in winter snow will cause temperature outside to plummet. This could cause problems for players who have taken the exceedingly thrifty approach to solitary confinement of a simple 2×1 mesh fence cell outdoors, as prisoners will soon die of exposure. Which is bad. The two have also shown off more of the prototypes Delay had taken a month to work on earlier last year, resulting in a bomb defusal project, Wrong Wire, and a curious exploratory mood experience called Scanner Sombre. 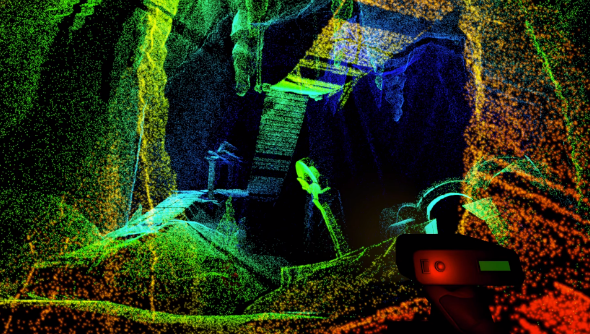 What they’ve shown so far of the game involves exploring an underground cave system with no sources of natural light and relying on LIDAR data points fixed to the geometry by a handheld scanner. The effect, inspired by the music video for Radiohead’s House of Cards, creates depth by using proximity heat maps in the RGB scale so surfaces close to you are red while data points further away range between green and blue. Wrong Wire apparently came out of a sub-game in Subversion, another prototype from way back in 2009, but shares many themes with fellow bomb defusal sim Keep Talking and Nobody Explodes. However, from the few bombs Delay demonstrated, it appears there is a far greater degree of complexity, even going as far as simulating timer chips used in anti-tamper circuitry. The two were demonstrated at Rezzed earlier this month, and viewers can vote for whichever game they prefer and Introversion will take into account whether to make both, one, or neither once public approval has been cast one way or another. You can see both below, as well as details of the Prison Architect update which is now already being piped to your installed builds.